A rescue crew with cold water suits went out onto the ice, entered the water and pulled the driver out of the vehicle with a rescue rope. HUDSON, Wis. — On Monday, the partially submerged pickup truck could be easily seen from the shore of the St. Croix River. Sunday afternoon, first responders looked out at a wall of fog and wondered how they were ever going to find the truck and its driver. “We really had no idea where he was and I don’t believe he knew where he was,” Hudson Fire Department captain Jay Penfield said. 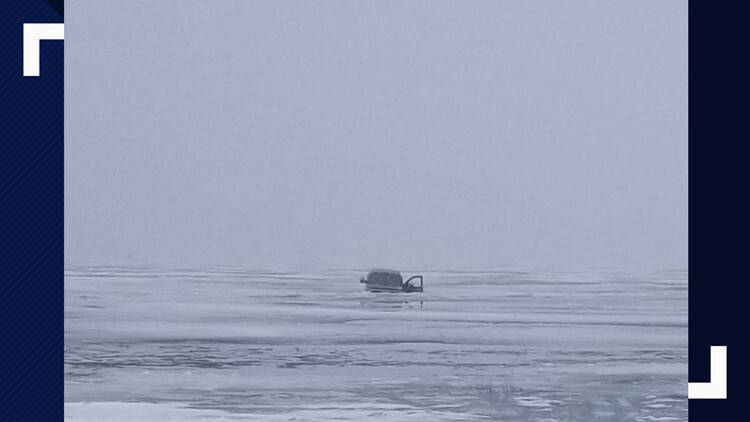 Shortly after noon, a family member called St. Croix County 911 to alert authorities the truck had gone through the ice with an older man inside. Soon, St. Croix County dispatch got the driver of the truck on the phone too. “We were communicating with the dispatch center to have him honk his horn so we could kind of hear where he was at,” Penfield said. First responders spread out, searching on the ice through the fog. “It sounded like there was water coming into his truck, which gets us a little nervous because you would think that’s not going to last very long before his truck goes under water,” Penfield said. A man was pulled from a submerged vehicle on the St. Croix River on Sunday. “I do see it, it’s still above water,” a first responder radioed back to dispatch. A sandbar had kept the truck from sinking beyond three to four feet. “He was real fortunate because there are areas of open water not far from where he was that would have been 30 feet deep,” the fire captain said. The St. Croix River had taken the truck – but spared its driver. “He was lucky that it played out the way that it did,” Penfield said.